We all want what's best for our kids, in every area of their lives! So why not put that desire into action by praying strategically over our children? 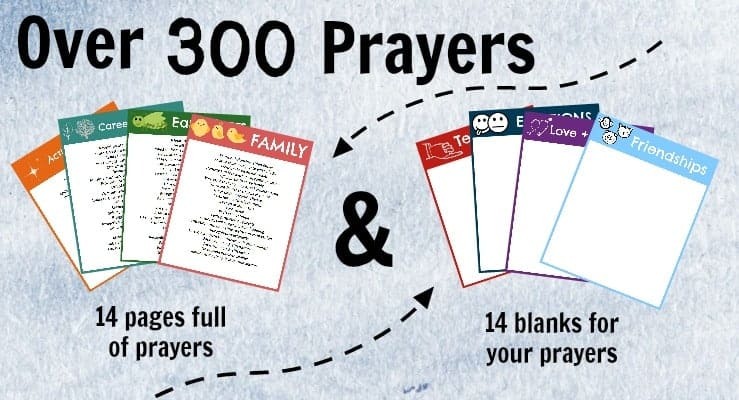 This is a 31-page printable book that includes over 300+ prayers for your child from pregnancy to marriage and beyond. It's separated into individual areas and each area includes a blank page for you to write your own prayers! I was feeling overwhelmed with the desire to pray for my kids and at a loss about where to start. There's so much God wants for them! There's so much I want for them! Actually, as I was entering in prayers for this book about protection from accident and trauma, an incident happened in our home that I'd like to forget, but now serves as a testimony that God is with us and does speak to us. And that our prayers to him are powerful! I pray your children and families are blessed for years to come and with a Christ-like legacy that lives on, and that these prayers go straight from your mouth to the throne of Heaven.